I was not present in Egypt yesterday, June 30, but I watched some of the wall-to-wall broadcasts on Egyptian television of packed squares and streets across the country, of gesticulating orators, defensive government spokesmen, and articulate commentators. The demonstrations across the country were, by consensus estimates, 7 to 10 times larger than the biggest anti-Mubarak crowds in early 2011. They dwarfed street rebellions such as those in Iran in 1979 or Peking in 1989. Simply put, they were probably the largest political demonstration in human history. 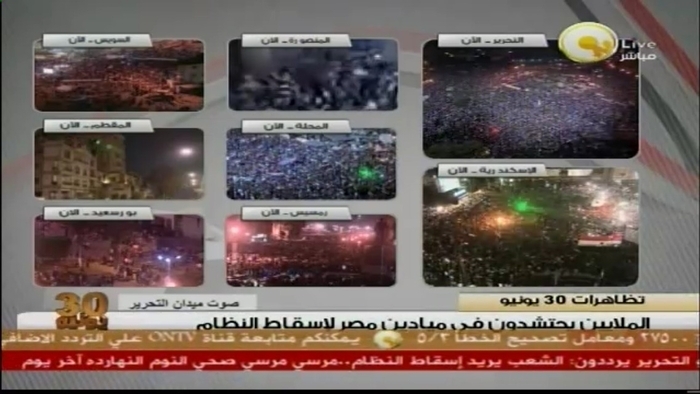 One television station called itself the "Voice of Tahrir Square" and simultaneously showed scenes from there and seven other cities. I was moved by the humanity of the crowds and (sometimes despite myself) thrilled by their centrism and constructive outlook. Who could have imagined a mere year ago, when Mohamed Morsi supposedly won the presidential election, that this massive Rebellion would be served up as his anniversary present, as he cowered behind walls in a distant palace? 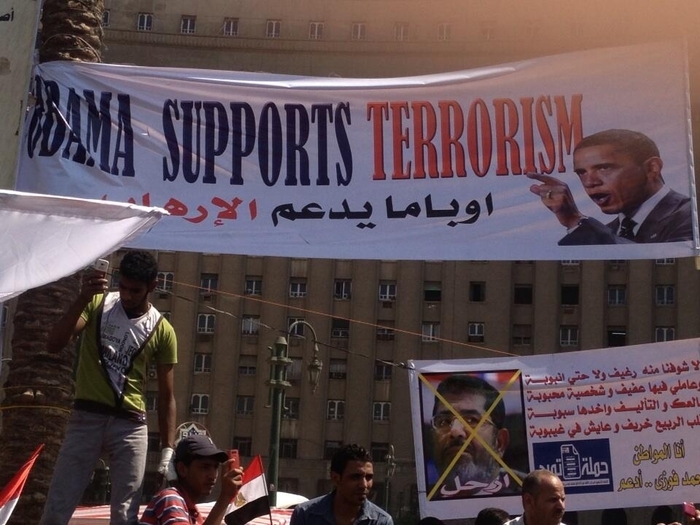 A sign in Cairo's Tahrir Square announcing that "Obama Supports Terrorism" in English and Arabic. The message from Egypt was crystal clear: It's time for the administration to stop coddling Morsi and to get behind the millions of protestors. But will the geniuses in the White House, the State Department, and Embassy Cairo hear? Obama's initial response today was tepid but at least mildly in the right direction: "Our commitment to Egypt has never been around any particular individual or party. Our commitment has been to a process." Whither Morsi: Awesome and satisfying as the June 30 rejection of Muslim Brotherhood rule was, what should come next is not obvious. Emotionally, I want Morsi and his foul crew gone as soon as possible from the corridors of power. Tactically, however, I fear that, once they are dispatched, the politically obtuse military leadership will likely muck things up and the opposition will be unable to unify or to handle the looming economic disaster. If Egypt's pain is to have benefit, it would be by discrediting Islamism. For that to happen, it's probably better that Morsi linger in office and be ascribed responsibility for the hunger and other disasters ahead.